The four seasons in French! Now is a good time to do little art projects at home since it’s so cold outside. Today you can teach your child the four seasons in French. You can cut out 4 tree trunks for your child out of brown construction paper, then for ‘le printemps’ (spring), on one tree they can put leaves that they cut out. For ‘l’été’ (summer), they can put leaves and apples on one tree. For ‘l’automne’ (fall), they can cut out orange, yellow and red leaves to put on a tree. Then for ‘l’hiver’ (winter), they can either leave it blank or they can add a little snow to it. Afterwards you can put up the 4 trees with labels on your ‘French Wall’ or fridge and you can practice the words. 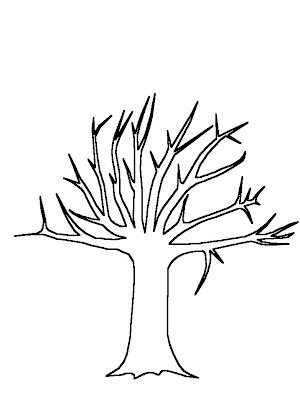 You can use the picture below as a guide for your tree, or you can double click and print it out and let your child color it brown. And don’t forget you can have your children practice their colors too while doing this activity!